I love baking and have made many attempts to bake from scratch over the years. There is nothing more frustrating to me than spending hours making a homemade cake and then having it turn out dry and unappetizing. My husband has been very honest that he prefers for me to make boxed cake mixes and so I have turned to Duncan Hines®. There are many delicious options to choose from and Duncan Hines® baked treats are always a big hit with my entire family. Duncan Hines® has a new line of Velvet Cake Mixes available in vibrant blue and pink colors. 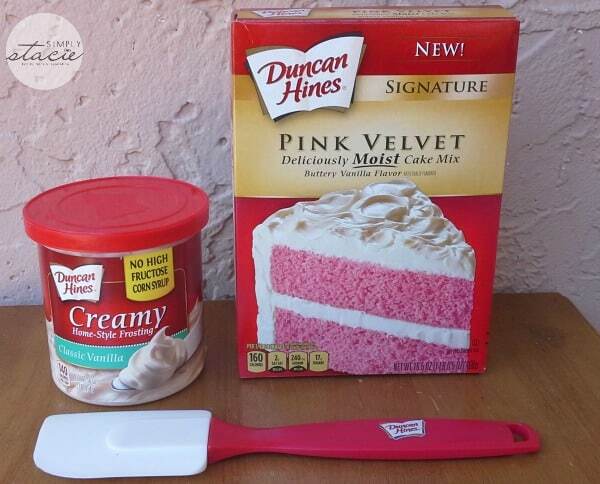 I made the Duncan Hines® Signature Pink Velvet Cake Mix and topped it with Duncan Hines® Creamy White Frosting. 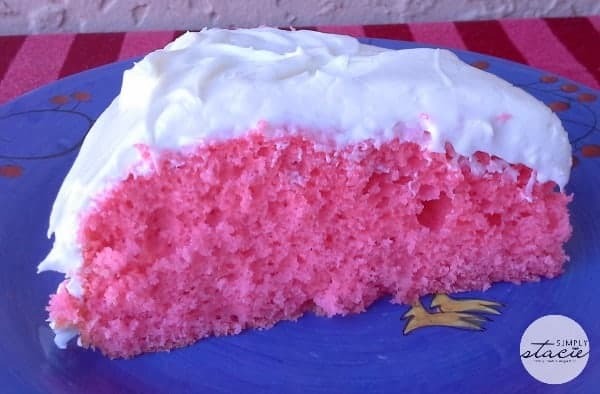 This moist delicious cake was so simple to whip up and it turned out to be a lovely shade of pink much to the surprise and delight of my children who thought that it was beautiful. The creamy frosting was very easy to apply to the cake once it had cooled after baking and the white accentuated the pink perfectly. How did it taste? Absolutely delicious and everyone was very complimentary (especially my husband) and they all asked for a second slice to enjoy. Duncan Hines Signature Pink Velvet Cake Mixes in either blue or pink would be the perfect choice for baby showers, themed parties, first birthdays, summer barbecues and just for fun. My husband loves brownies and asked me to bake some recently. I surprised him with Duncan Hines® Decadent Salted Caramel Brownie made from a mix and it is his new favorite. It is the perfect blend of sweet and salty and has a rich, chewy texture that is mouth-wateringly delicious. It took just a few minutes to mix up the ingredients and then put it in the oven to bake…..perfect for busy moms like me. When you are baking this summer remember to check out the wonderful selection from Duncan Hines® as there are so many great product to choose from including cake mixes, frosting, brownies and more. You can even visit Duncan Hines to check out all of the creative recipes that you can make starting with a mix. Updated: If you are looking for Duncan Hines Blue Velvet Cake Mix, I found it on Amazon! Connect with Duncan Hines on Facebook, Pinterest and Twitter. Thank you for this review. I have always bought Betty Crocker mixes simply because my mother always did. But now that I have read your review and seen your pictures, I am going to try out a few of the Duncan Hines Signature Cake Mixes and the Decadent Brownie Mixes. I love to bake from scratch but so often just don’t have the time. So I have used box mixes many times so that my family can have something sweet. Thanks again for the great review and beautiful pictures!! Mmmmm, I’ve had the red velvet from Duncan Hines but never the pink velvet. Thanks for sharing! Thanks for sharing this! My daughters will be happy to get pink cakes for their birthday! My that is a very pretty colour, I haven’t seen these ones in the stores yet, as soon as I see these I am going to pick me up a few, everyone loves colourful cakes!! I was wondering if it (the velvet cake mix) was worth the money to try as I think it’s about $3.99 here, so will have to pick up one next trip into town. Duncan Hines is the only cake mix we buy! I haven’t tried the Velvet mixes yet, I wonder how this pink one would taste. I like Red Velvet myself! Yum and so pretty! I bet your kids loved the pink color. Would be really fun for spa girl sleepovers, a princess party….mom’s day to treat herself… 🙂 The cake sounds light and a moist, but those brownies have me intrigued. I love brownies and lean towards the sweet and salty. I didn’t realize you get that in a mix. Pink Velvet is something I’ve never seen before. I’m definitely going to have to try this out! Duncan Hines always has some great products. The salted caramel brownies sound great. Kids would love a pink or blue cake that is for sure. I NEVER make my own cake and use Duncan Hine excllusively for what my family calls “moist and fluffies.” I so love the idea of blue cake – it would be awesome for the 4th of July with red Jello! I use Duncan Hines mixes a lot. I love the Red Velvet, I haven’t seen the pink or blue velvet but will be on the lookout…I was wondering does this have a specific taste?…like strawberry?…or is it just plain? I only know red velvet, this is exciting! We are huge fans of the Velvet lines – starting with their Spring Velvet mix that I topped with a favorite buttercream frosting – HUGE hit! I haven’t had Ducan Hines in ages! The photos of the cake make it look so pretty. I haven’t yet tried these new mixes and now I can do that. This looks so pretty and sounds so yummy! I will have to look for these in-store! I love to bake from scratch but every once in a while I come across a recipe that uses boxed cake mix as a base. I love red velvet, but, like a lot of commenter here, I haven’t seen the pink or blue mixes yet. I will give them a try. And the brownies sound heavenly. The Pink velvet cake looks so pretty. Perfect for the birthday party I’m planning!! My daughter’s favourite colour is pink…she would love this! I love Duncan Hines cakes although I’ve never tried this one. I really love the colour and I agree what a great cake for baby showers. Cake is one of my favorite desserts, and the Duncan Hines velvet cake mixes are so delicious! I am going to make one for the 4th of July and have it with ice cream. My mother used to bake me a Duncan Hines birthday cake every year, but never a pink velvet! That looks incredible! When I don’t feel like baking from scratch, I always use Duncan Hines cake mixes. Duncan Hines is our favourite I haven’t tried the Velvet mixes yet. But they look so rich and delish ! Can’t go wrong with Duncan Hines! It has been a long time since I baked a cake using Duncan Hines® cake mix. I just visited the website and there are so many new products. I would love to try the Red Velvet cake mix, the Triple Chocolate Cake mix, the Signature German Chocolate Cake Mix, and the German Chocolate Decadent Cake mix. Thank you for sharing this review. I just bought a couple of the red velvet mixes the other day – can’t wait to try them. The Pink and Blue would work great for doing a “Is it a Boy or is it a Girl” baby reveal that I have been hearing about for awhile. Much less expensive than having the local cake shop make. I really like cakes as a treat and I prefer making cakes from scratch but a boxed cake mix makes baking quick and easy sometimes. Thanks for the review, I’ll keep these in mind the next time we get coupons for Duncan Hines. Will have to try the Pink Velvet cake mix. I do cook quite often with mixes. Next time I shop will have to buy this mix. Oh wow! Love the pink! Looks delicious! I have never had velvet cake before. I have heard it is yummy, I will have to add this to the shopping list. Oh my little grand daughter would be thrilled with a pink cake!